While snow and ice inflict the country, you may be wondering to yourself - what am I going to do while waiting for my car to defrost? How am I going to pass the time waiting for my delayed train? Just how will I handle huddling up in a cafe waiting for my toes to warm up? We have the solution - the latest Weekly Sett, with news and articles to while away the hours as you wait for the warmth. Emotions are the key to getting people onboard with a product. But, with one bad gut feeling a decision can be made never to trust a product or service again. 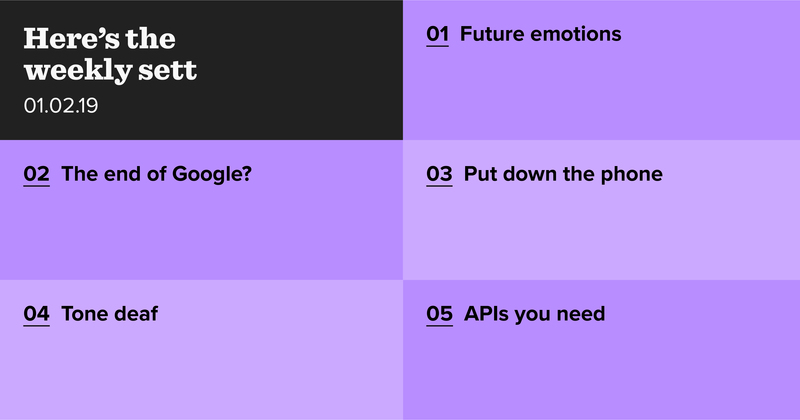 Smashing Magazine argues that interfaces of the future should use the concept of emotions within the foundation of product design. This is especially important in the cases of AR, VR, and voice mediums, to combat the perils of changing moods. Number two - The end of Google? Google, the unspoken overlord of the Internet, made most of its money from ads popping up all over your desktop. However, in the face of changing ad tides, Hackernoon suggests that we may be facing an unimaginable future post-Google. With more internet users looking to Amazon as their prime product search destination, Google’s key cornerstone is crumbling. Alongside this, ad blockers are rife especially amongst the most valuable demographics: millennials and high earners. It’s beginning to feel like any action Google makes to appease them while still keeping ads is met with displeasure. On top of all these advertising woes, Google is facing profitability questions on its other assets such as YouTube, and failed to jump on innovations that could have stopped this descent into doom. It’s not brand new information to be told that we spend a lot of time looking at phone screens. But alarmingly, in 2018, Americans collectively spent $349 billion and up to 370 billion hours on their phones and other mobile devices. With these stats in mind, the New York Times has outlined how to make 2019 different. From planting trees, to reading Marcel Proust’s In Search of Lost Time, to improving waste management, there’s plenty of ways to use your time and money to make a difference in the real world, or in your own, rather than scrolling through Facebook again. Harvard University’s department of psychology has opened a new lab to study the science of music. Part of this includes the creation of a citizen science platform where everyday folk can take quizzes and contribute to the research. The four tests currently on the site include: 'How tone deaf are you? ', 'Can you tell what a song is used for even when you have no experience of the culture that made it? ', 'Who’s listening? (a baby or an adult)', and finally a difficult synthesiser game. Learn more about the quizzes (and perhaps try them out yourself) and the new Music Lab over on The Verge. As companies look for new ways to support customers, or to provide something truly unique, more and more have sought to offer ‘X as a service’. So, over on Dev, there’s a round up of the APIs you didn’t know you needed. This includes a Taco API, ALL CAPS AS A SERVICE, and a Bacon Ipsum text API.